I like this. Its a funny story and the protagonist doesn't built a harem (a plus for me) and his love interest is clear early on. There are a lot of good Character's too, like Gus! I also like how his lack of common sense is portrait. So funny! An anime for this has been announced right? Strangely there hadn't been any follow up announcements. I remember this was one of those titles that stood out because of the antagonists. They haven’t even announced a format (TV/OVA etc) as far as I know. The novel is published under Enterbrain, like Kokoro Connect, so it’s now a real possibility. I wholeheartedly support the notion of adding this LN to JNC! 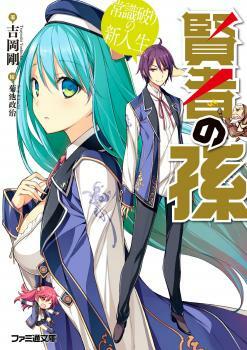 I found the manga originally and the searched for the LN. I stopped reading after I caught up to what was then translated. It would be great if JNC could pick this up. @silvermane is there a chance jnc will license it ? it would be great if they did. It was announced recently that there's going to be an anime adaptation now it seems. Nice, I haven't read the WN of this yet but i thought the Manga was pretty decent. I would seriously love to see this novel picked up it was one of the first Japanese things I ever read and I really wish it had an official translation. The manga for the series was good and it's getting an anime. Tho some of the side characters in the manga are a little under-developed so it's be awesome if it was licensed. (with the upcoming anime it'd also be nice to read all the finer details and stories that the anime will probably skip over too). Checked manga out and based on what I read so far its pretty nice, there is no harem and the relationship between main character and heroine is, sadly, childishly pure. TV Anime set for April (don't know if that month was official before or no?). Saw the trailer last night and was surprised at how high budget it seemed. Looks like this one is getting anime adaptation on 10th of April. @smiley_101 yeah totally agree. Went into the anime with my doubts of liking it but ended up liking it. Gives me Slime vibes and I insta loved Reincarnated Slime LN. So I hope a company picks up the license. I would love to read the LN if possible so I also hope JNC can get a license for it. The anime moves pretty fast so I’m sure there’s a lot of missing details that would be explained in the novels.